Tucked away in a 350-hectare estate filled with olive groves, oaks and almond trees, La Bobadilla, a Royal Hideaway Hotel is as far from the trappings of civilization as you can get. For 30 years now, La Bobadilla, a Royal Hideaway Hotel has been a Spanish getaway of choice to escape the daily grind. The hotel feels hidden from the modern world and it essentially is, nestled in the Loja mountain range but within a manageable 40-minute drive from Málaga Airport. Designed like a traditional Mediterranean village with white-washed houses arranged around a natural landscape and a lagoon-style pool, it’s a place to find romance, secluded moments and magical culture in the heart of Andalusia. Beyond the perimeter of the hotel, the surrounding countryside is just as enchanting- Think olive groves that stretch as far as the eye can see and mountains riddled with tracks for trekking and biking. The area is a playground for outdoor activities but let’s be honest, most people who come here are in search of days whiled away on sun loungers and evenings that culminate in caviar and olive oil tastings, and La Bobadilla delivers. 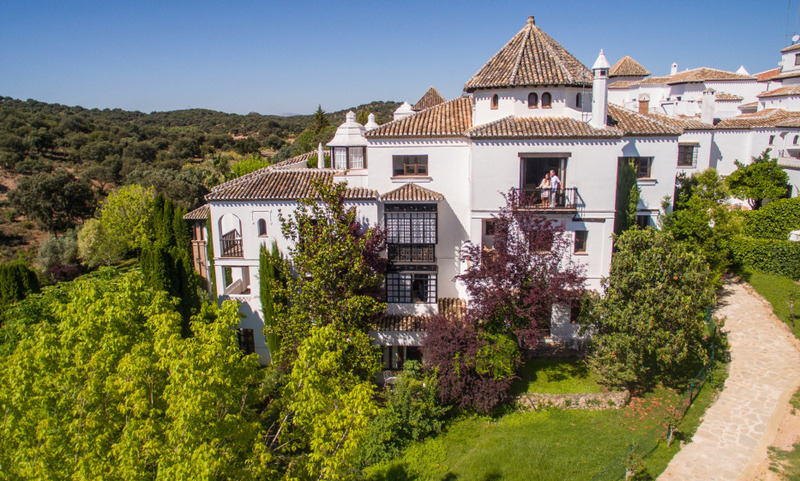 Location in a rural estate within 1000 acre state, very close from Granada, Sevilla Cordboba or Malaga. La Bobadilla is an excellent hotel which enjoys an exceptional location and whose main asset is the friendliness and professionalism of all the staff, such as the restaurant manager, which symbolises the Andalusian tradition sought by the clientele of La Bobadilla. Excellent. Everything is fine. Missing an opportunity for snacking at the pool and a range of French TV channels, as well as a more powerful WiFi. Bobadilla is a beautiful place. Absolutely charming staff as a whole. Very good stay. We recommend the hotel. Many thanks. La Bobadilla is a wonderful hotel, beautifully decorated, in a magical place with a great and very attentive staff. I couldn' t possibly think of any improvement in this hotel. It is almost perfect. If I really had to say something, it would be: a bit of airco would be nice in the corrridors of the hotel public areas. Very nice and charming hotel in the middle of nowhere. Very relaxing atmosphere and ambiance which is not found in most major international luxury hotels. A unique and unforgettable experience.